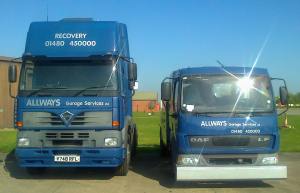 Allways Garage Services provide garage, breakdown and recovery services to many of the motoring organisations and to private customers. Based on Alconbury Airfield within half a mile of A14 and A1 Allways are ideally located to provide fast and effective support to its customers 24 hours a day. Allways Garage Services is a fast expanding business offering a wide variety of services to its customers and the public alike. Our employees have many years experience in the motor trade, having worked on a wide range of vehicles and technologies over the years gaining skills and experience in mechanical, electrical and manufacturer specific technologies. We offer maintenance and repair services for company / fleet vehicles, including cars and all commercials with no limit on size or amount of vehicles. We are located just off Jnc 13 of the A14, Jnc 14 of the A1(m) opposite Alconbury truckstop. At Allways we believe your vehicles are an investment to your company and not just a piece of equipment so with this in mind we can help you to keep your costs down by offering a reduced rate on all repair work, maintenance , inspections and even recovery. Your discount rate can increase dependant on the amount of work we receive , this in-turn helps us all to prepare for the future. We can offer you a complete breakdown service nationwide with just one phone call to our 24hr control centre. Make Allways Garage Services your first point of call.